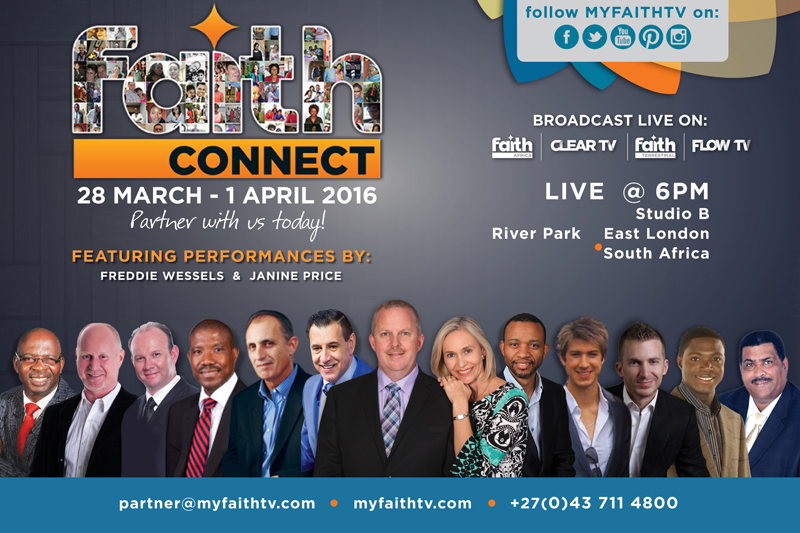 Join us for the first Faith Connect for 2016 from the 28 March - 1 April 2016 at 6pm - 10pm every night. Guest Speakers include Haruna Goroh, Dr Stephen Smith, Nicky van der Westhuizen, David Mulutsi, Dr Leon van Rooyen, Ps John Torrens, Apostle Mangaliso Matshobane, Tommy Deuschle, Jonathan Shuttlesworth, Ramson Mumba and Neil Isaacs. Guest Performances include Freddie Wessels and Janine Price. All evening meetings will be televised live on DSTV channel 341, FlowTV on Sky channel 595, ClearTV on Vivid Free to air satellite and Faith Terrestrial.